Frank Warren improves on his matchmaking by setting up Ricky Burns with Paulus Moses. I was still getting over the horrific match-up that is Nathan Cleverly vs Tommy Karpency when I heard that Ricky Burns, another Frank Warren promoted fighter, was going to announce his next opponent. I had high hopes. If you look over Ricky’s career he has won his titles by beating top fighters; in super featherweight he beat Roman Martinez and for the interim Lightweight WBO belt he scored a win over Michael Katsidis. For a while it looked like his first lightweight defence would be against Anthony Crolla. This would have been okay, but Crolla hasn’t earned a title shot. We waited for Burns' opponent, and with his back against the wall and negative comments hurled his way over the Cleverly defence, Warren pulled it out of the bag. Paulus Moses was announced as Ricky Burn's next fight. He is an ex-world champion with only one blemish on his record, a loss to Miguel Acosta - nothing to be ashamed of. After losing his WBA Lightweight title in 2010, Moses has beaten three journeymen and will get what looks like once last chance at being a world champion. Could Warren have gotten Burns a better opponent? Of course he could. 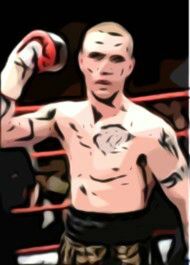 The lightweight domestic scene is great, with Kevin Mitchell and Gavin Rees both presenting more attractive fights. The Burns - Mitchell fight is most likely to happen in the summer, so right now we have to settle for Ricky Burns vs Paulus Moses. That's not so bad. I'm supposed to be talking about Ricky Burns and Paulus Moses so I don’t want to keep yapping on about Frank Warren, but I can’t help but feel that Warren was under some kind of pressure to get a credible opponent for Burns. Think about it, Warren received heavy criticism for his Cleverly/Karpency match up, Boxnation had a couple of cards cancelled and was taking flack from the critics or the fans. Some boxing fans could have been one more poor fight away from picking up their phone and dialling BoxNation's cancellation number. Even though I think Paulus Moses is a credible opponent for Burns, I don’t think Warren would put the Scot in the ring with someone who has a greater than fifty-percent chance of beating him. A defeat would end his big plans for Burns later in the year, which must include a domestic superfight with Kevin Mitchell. I expect a stoppage victory for Burns. I'll give Frank Warren credit for not matching Burns up with the Tommy Karpency of the Lightweight division and instead putting him in there with an ex-world champion, but it's not a dynamite fight. So far, 2012 hasn't been the old promoter's year and he will have to pull something pretty big out of the bag to compete with Eddie Hearn.